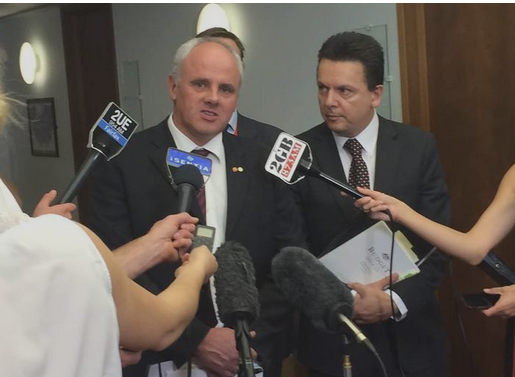 John Madigan and SA’s favourite Greek, Nick Xenophon. The first 200 pages are filled with facts, clarity, common sense and compassion; the balance, labelled “Labor’s dissenting report”, was written by the wind industry’s parasites and spruikers – including the Clean Energy Council (these days a front for Infigen aka Babcock & Brown); the Australian Wind Alliance; and Leigh Ewbank from the Enemies of the Earth. Predictably, Labor’s dissenting report is filled with fantasy, fallacy and fiction – pumping up the ‘wonders’ of wind; completely ignoring the cost of the single greatest subsidy rort in the history of the Commonwealth; and treating the wind industry’s hundreds of unnecessary victims – with the kind of malice, usually reserved for sworn and bitter foreign enemies. Among those Senators on the Committee – who pulled no punches in getting the truth out – was STT Champion, Victorian Independent, John Madigan – who chaired the Committee. With his ‘never say die’ attitude, John – armed with the Inquiry’s detailed findings on the adverse impacts on human health and well-being caused by incessant turbine generated low-frequency noise and infrasound – including sleep deprivation – went on the attack again. 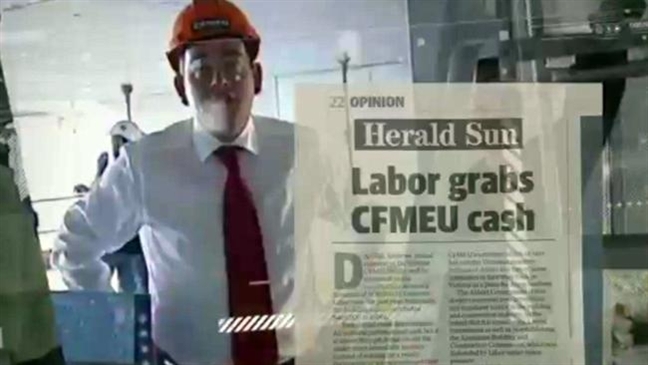 This time his target is the malice and malfeasance of Victoria’s Labor government (an outfit which is simply the political wing of the CFMEU). Its front man, Daniel Andrews’ first move in office was to abolish the 2km setback distance between homes and turbines; and to otherwise turn his loony-left dreams of carpeting Victoria with thousands more of these things, into hell on earth for hundreds of rural communities. Call us a tad cynical, but STT’s Spidey Senses suggest that Labor’s (or rather the CFMEU’s) policy is all about generating fleeting construction work for CFMEU members, in the first instance (see our post here); and ensuring that Labor owned and run Union Super Funds get to wallow in an endless sea of REC subsidies (see our post here) – to be ripped from all Australian power consumers as a $46 billion retail power tax (see our post here). Well aware of what’s actually happening to Victorian communities set upon by wind power outfits – like Macarthur, Waubra and Cape Bridgewater – principally because he engages his ears before his mouth – John let rip with this warning for Andrews – and all those like him, who seem to think that Australian citizens will simply hand over their hard-won property rights without a fight. Senator John Madigan, independent for Victoria, today warned Victorian Premier Daniel Andrews his strident and ideological push to support wind farms could open the state up to massive legal liability claims. Senator Madigan, who recently chaired an exhaustive Senate inquiry into the wind industry, said he had written to the Premier saying the Victorian planning department had failed regional Victorians. “Unless current processes and regulatory arrangements are improved, the Premier’s desire to attract wind energy investment to Victoria could leave the state liable to future claims of nuisance by those who would suffer ill-health as a result,” Senator Madigan said. “Where there is a reasonably foreseeable risk of harm the law requires the state of Victoria to act prudently to avoid that harm. Senator Madigan said the recent Senate wind farm inquiry was one of the most detailed ever undertaken and attracted submissions from dozens of Victorian residents and councils. “Victorian submitters expressed an overwhelming lack of confidence in the adequacy and application of wind farm noise standards and in the regulatory governance of wind farms more broadly,” Senator Madigan said. “Victorian councils also reported high levels of concern and low levels of confidence in their ability to handle the administration and enforcement of wind farm planning permits. Senator Madigan said he recognised the need for all state governments to pursue policies that created clean energy opportunities. “But let’s be honest here – renewable energy comes in more forms than just wind. We’ve pulled subsidies from the car industry which employed 40,000 Australians yet we’re continuing to pump money into industrial wind technology which is neither efficient nor economic. You can’t run a factory on a wind turbine. Daniel Andrews: with a nod to his paymasters. Federal Lib M.P. for Wannon in South West Victoria. Dan the man is in bed with the windies mob and their cohorts. …….. think that he was a liberal Politician the last time I looked. I wonder what the head boy really thinks of him? It is news to me that Labour are in power, I thought Tony Abbot was the Prime Minister and that he belonged to another political party. Val, Tony Abbott and his Coalition is in charge of the Federal Government. Labor took control of the Victorian State government at the last election. Senator Madigan is keeping the fire hot and the anvil and hammer ready, ready to drive home a newly formed hot poker tip when ever a Government needs to be remind of their duties. Hopefully the Federal Government will accept all the recommendations of the Inquiry and the Senate will stop the game playing and recognise their duty of care to the people of this nation as well and support the Recommendations. State Governments are not there to look after the needs of a useless industry which cannot meet its stated production capacity, or cause harm to the people and environment, nor are they there to ensure these companies are able to secure money from PUBLIC PURSE to keep them functioning, they are there to look after the interests of the people and to ensure NO HARM IS DONE to them and that their environment remains healthy and suitable to live in. Keep keeping the fire hot with the iron ready to be hammered – Senator Madigan. Senator Madigan will use the red hot poker if he has to. He is not fooling, and that is one thing I do know.